Pictured is the fiscal note for HB717. The original note was corrected by legislative staff. ***NOTE: This story has been changed to reflect a corrected fiscal note that was posted to North Carolina General Assembly website. House lawmakers today will consider a measure that redraws judicial and prosecutorial districts in North Carolina, changing the way voters elect judges and district attorneys. Until today, the cost of House Bill 717 has not been discussed. 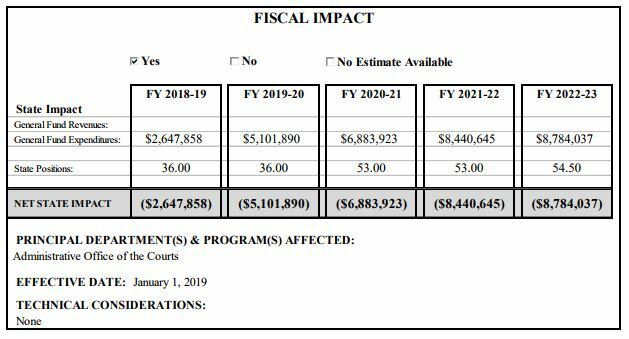 A fiscal note that is posted on the General Assembly website shows a budget impact of more than $31.8 million over the next five years. The first judicial redistricted maps were released in June. Lawmakers will vote on the maps the same day they assess the cost of the maps to North Carolina taxpayers. The biggest cost each year is district court judges. HB717 adds 10 district court judges effective Jan. 1, 2019, and five more effected Jan. 1, 2021. The total position cost for one district court judge in FY 2018-19 is $195,081 recurring and $9,853 nonrecurring, according to the fiscal note. The bill also adds seven superior court judges effective Jan. 1, 2021, and one at the beginning of 2023. HB717 will also require three additional judicial assistants beginning Jan. 1, 2019, 5.5 at the start of 2021 and .5 at the start of 2023. The bill adds 23 assistant district attorneys across the state at the beginning of 2019. You can read the full fiscal note and see a breakdown of the costs here.